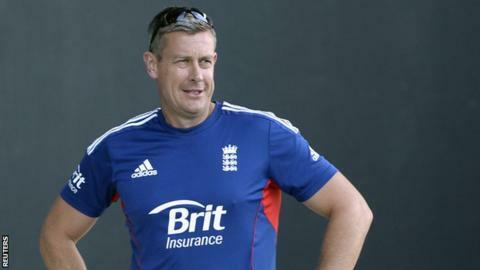 Ashley Giles has quit as an England selector and has been replaced by Nottinghamshire director of cricket Mick Newell. Former limited-overs coach Giles had been favourite to take over from head coach Andy Flower but was overlooked in favour of Peter Moores. Newell, 49, joins James Whitaker, Moores and Angus Fraser as a selector. He led Notts' successful YB40 campaign last season and has also overseen two County Championship title wins. Newell, who played for eight years at Trent Bridge and has also previously served as a coach on winter tours with the England Lions and England Under-19 teams, was one of the candidates interviewed for the England head coach job. "We welcome Mick to the panel and his passion, cricketing knowledge and in-depth understanding of our county game will be invaluable as we seek to identify potential international talent and develop outstanding England teams across all three formats of the game," said Whitaker. Giles was in charge of England's disappointing World Twenty20 campaign in Bangladesh, in which they failed to progress beyond the group stage and bowed out with a shock defeat by the Netherlands.